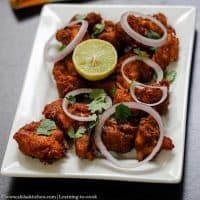 Chicken 65 Restaurant Style is a famous starter recipe in many of the Indian Non veg restaurants. 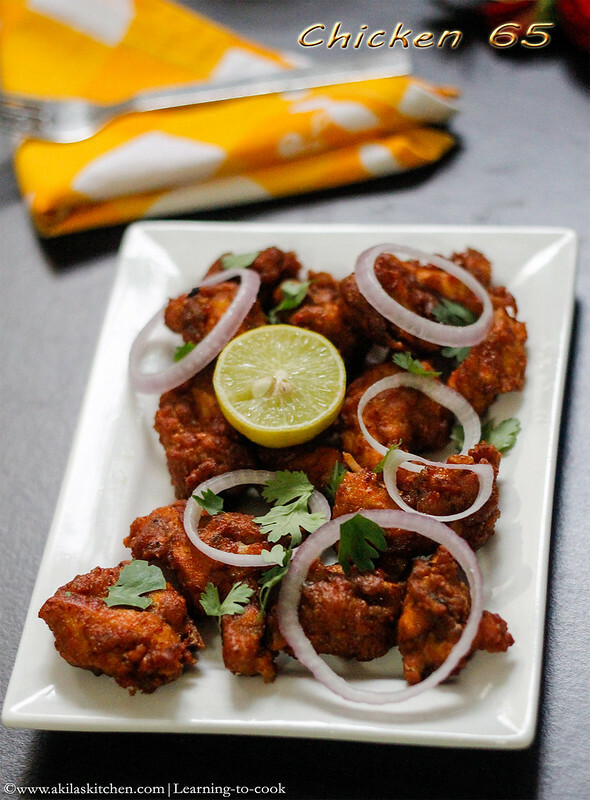 Many do like this spicy, juicy and tasty recipe, which is deep fried in oil. Restaurant Style Chicken 65 recipe with step by step instructions for your easy understanding and learning. 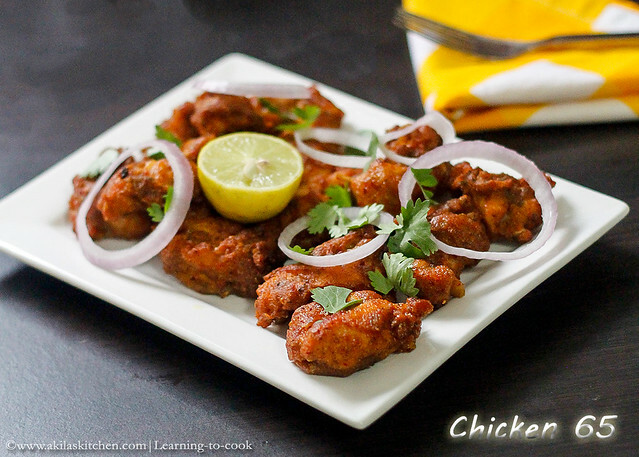 Most chicken 65 recipe is made with boneless chicken pieces, marinated with Indian spices, and deep fried. The more it is soaked, the more juicer it is. Chicken 65 is always our family favorite. I already have posted chicken 65 which I have tried on my own. Recently I watched this video for baby corn 65 and tempted to try it for the chicken immediately. My hubby and kids loved this version also but my lil one complained of bit spiciness. Will need to reduce the spiciness next time at least for her. Do try this restaurant style chicken 65 at home n enjoy your day. 1. Grind the ingredients mentioned in To Grind and make a coarse paste. If needed add little water. 2. Add the mentioned flours, powders, salt, curd, lemon juice and the ground paste. 3. Mix them well. If water is needed add little by little. To this add the chciken pieces and allow to marinate for 1 hr. 4. After 1 hr, heat a vessel with oil in medium flame. 6. Filter the excess oil in kitchen tissue. 7. 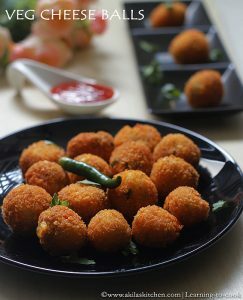 Serve then hot as a evening snack snack or as a side dish. 1. After adding the chicken pieces in oil, start rolling the oil along with the chicken pieces for even browning, if you are beginners in cooking. 2. You can adjust the chilli powder according to your family taste. 3. Boneless chicken works good for this recipe. Chicken 65 is always our family favorite. I already have posted chicken 65 which I have tried on my own. Recently I watched this video for baby corn 65 and tempted to try it for the chicken immediately. My hubby and kids loved this version also but my lil one complained of bit spiciness. Will need to reduce the spiciness next time at least for her. Do try this restaurant style chicken 65 at home n enjoy your day. Grind the ingredients mentioned in To Grind and make a coarse paste. If needed add little water. Add the mentioned flours, powders, salt, curd, lemon juice and the ground paste. Mix them well. If water is needed add little by little. To this add the chciken pieces and allow to marinate for 1 hr. After 1 hr, heat a vessel with oil in medium flame. Filter the excess oil in kitchen tissue. Serve then hot as a evening snack snack or as a side dish. After adding the chicken pieces in oil, start rolling the oil along with the chicken pieces for even browning, if you are beginners in cooking. 2. You can adjust the chilli powder according to your family taste. 3. Boneless chicken works good for this recipe. *post first published on July 30, 2014. Updated with recipe. Picture is drool worthy.. Looks so tempting!!! tempting 65 and beautiful clicks!!! looks perfect and tempting. Love it. 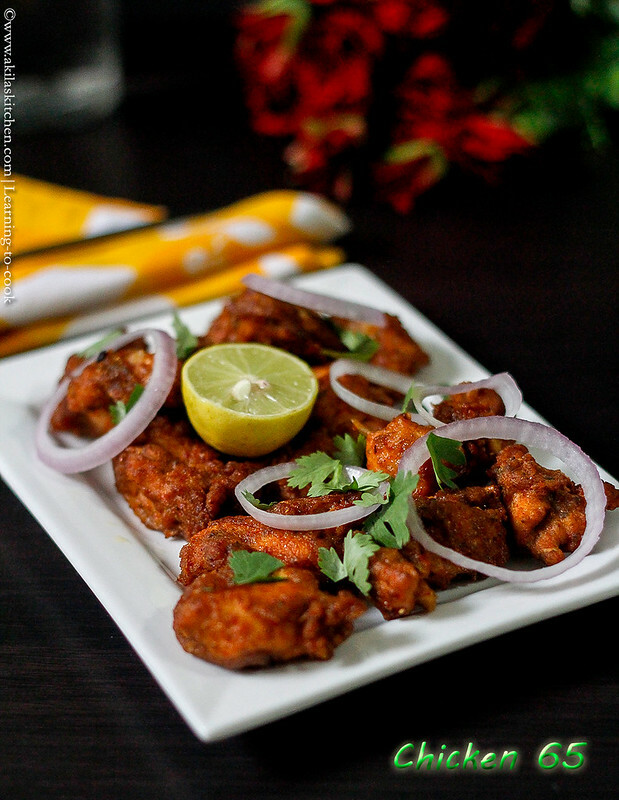 mouthwatering recipe and clicks too…. I have not tried this restaurant style version yet and am going to follow your steps and truly eager to taste it………. Gosh! I love it too very much. I'm gonna try a vegetarian version of your recipe this week with mushrooms.